When the grass tops-out, I’ll fish a fluke on the edge of the grass, a plastic frog on top of the grass or a jig in holes in the grass. I don’t think Guntersville’s grass will top-out until about mid-April. 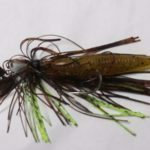 Having a lot of grass may not hurt us at all this spring, because we’re already catching some good-sized bass by fishing on the edges of the grass, and we’re catching some bass on the Stanley Ribbit Frog (http://fishstanley.com/tackleshop/) right now. I’m often asked, “Can you see the bass on the bed on Guntersville before and after the grass comes up?” I’m sure you can see some of them, but I don’t fish for bedding fish. 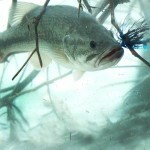 I think catching bedding bass in tournaments is one of the reasons that our bass population is in question. Several articles have been written saying that the bass fishing on Lake Guntersville isn’t as good as it once was. 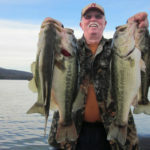 However, there is more bass fishing pressure on Guntersville Lake now than there ever has been, especially on weekends. I believe that the bass have wised-up to fishing pressure. They’ve moved from the places they once were and moved to areas where anglers don’t fish, because 2 weeks ago, we had a winner stringer of five bass that weighed 40 pounds, 11 ounces win a one-day tournament here at Guntersville. Nine pounds, 9 ounces was the biggest bass in that five-fish limit. We had a high school tournament a couple of weeks ago, and the winning five fish weighed 32 pounds. The day after the high school tournament, another tournament was held, and the winning five fish weighed 28 pounds. However if anything has hurt bass fishing on Lake Guntersville, I believe it’s fishing for bedding bass, especially sight fishing for bedded bass. Think with me for just a minute. 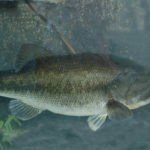 If a female bass is on the bed and hasn’t started laying her eggs or still has eggs to lay, and a tournament fisherman catches that female bass, then if the fisherman put in at City Harbor but caught that bass in Mudd Creek, about 30- to 35-miles away, he’ll have to place that bedding female in his livewell. Then he’ll have to run all the way to City Harbor, bouncing around on the waves, shaking those fish up and putting the female bass in a weigh-in bag, and turn the fish loose at City Harbor. Do you think that bass will swim that 30 to 35 miles back upriver to find her bed? So, this is one of the reasons that I don’t like bed fishing. 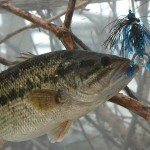 Now having said that, I will be guiding customers on bass fishing trips during April. Even though we’re not looking for or targeting bedded bass, I’m sure we’ll catch some. However, when we catch those big females, we’ll bring them up to the boat, dip them up in our dip net, hold them up and make a couple of pictures. Then we’ll release that female where we’ve caught her, so, she can easily return to her bed and continue to lay her eggs. This is just my opinion, and there are probably a lot of bass fishermen who will disagree with me. We all fish and take care of the bass according to our own code. Once I was asked, “What’s causing all the fishing pressure at Lake Guntersville?” When a tournament angler brings in five fish to the weigh-in scales that weigh a total of 30-40 pounds, he gets the attention of every angler in that tournament. Each angler in that tournament will tell all his buddies about the big stringer of bass that has been weighed in at the tournament where he’s fished. All those buddies will tell all their buddies. If six to eight tournaments take place every weekend, starting in March and continuing until October or November, quite a number of people are being told about those heavy stringers of big bass coming from Guntersville. 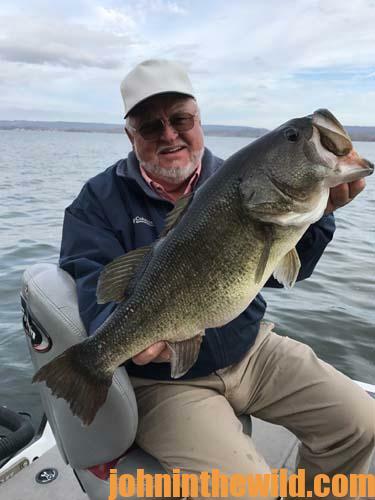 Every fisherman thinks that he or she can come to Guntersville, maybe not catch five fish that weigh 40 pounds but be fairly confident that they can catch five fish that weigh a total of 20-30 pounds, and many of them do. 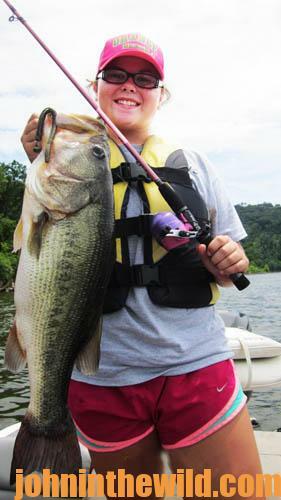 The word has been out about the outstanding bass fishing at Guntersville for many years now. Besides the bass-club tournaments that are held here, many national tournaments are filmed and shown on TV that people see the size of bass that we have here at Guntersville. 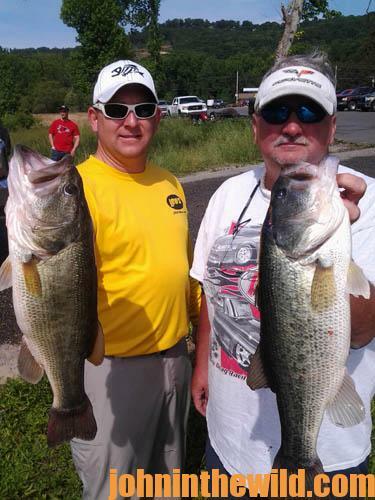 No question that Guntersville is one of the largest big-bass lakes in the nation. 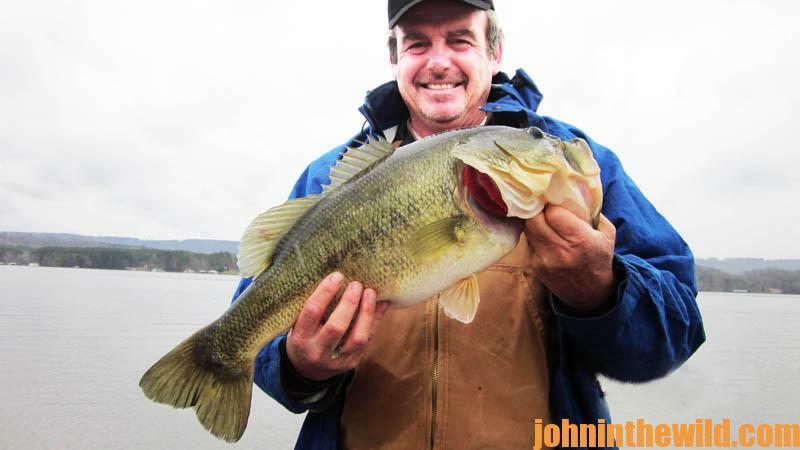 Most people here at Guntersville don’t get excited about a 6, a 7 or an 8-pound bass. But a 9- to 12-pound bass will get some attention. Also, today we’ve got more ways for getting out the information on the big bass at Guntersville than we’ve ever had. If a fisherman catches a bass that weighs 5 pounds or better, he’ll take a picture of himself holding that bass with his cell phone. Then everybody he knows will see the size of the bass that he’s caught at Guntersville. Don’t get me wrong. I’m all about promoting the lake. I love having plenty of people coming here and enjoy catching and releasing these big bass. I’m just saying that fishing in the middle of the week rather than on the weekends dramatically will increase your odds of catching that big bass that you dream of taking on your next trip to Lake Guntersville. I’ve discovered another secret to Lake Guntersville bass fishing. On every trip you make to Lake Guntersville, try to fish new places that you’ve never fished. If you go to the same spots where you’ve always caught bass, and fish most of the same lures that you’ve caught bass on in those places, you’ve probably done a good job of educating the bass on what lures not to take. I also watch where most people are fishing, especially on the weekends. They’ll go to those spots, because they know that bass are there. But when I take customers, I’ll always fish one or two areas I’ve never fished before to see if there may be bass there. Any day I don’t have a guide trip, I try to find regions to fish that I’ve never fished previously that I think may be holding bass. I’ll find a little pocket or a cove that I’ve never fished, go to that spot and fish it with a wide variety of baits to learn whether any bass are there, or to find a new place to take my customers to fish. I’ve found numbers of productive places that hold bass by fishing new spots when I don’t have trips. I will fish what is known as a community spot, areas on the lake that everyone knows usually produce big bass. A lot of people won’t be fishing those spots if they aren’t catching bass there. At a community spot, I’ve learned that something is on the bottom, or there’s some type of structure or current that causes that place to concentrate baitfish that attracts bass to move in and out of the spot to feed. I’ve caught some really-nice bass fishing community spots during the week. Bass aren’t that different from us. We know where the best buffets are close to our home, and we know where the best steak houses and the best Chinese restaurants are. I think the bass know the same kind of things about what we’ve labeled community holes. Bass show-up at the community holes because food is there. Two years ago I spent most of the winter putting out 400 brush shelters. Today some of them hold bass, and some of them don’t. But anytime I’m close to any of these brush shelters, I’ll check them with my side-scanning depth finder to see if they’re holding bass. Often on days when the fishing is really tough, I can go to some of these spots and catch some good bass.